The Internationale: Trump waged his entire presidential campaign on the theme of « bringing back jobs to America » and « making America great again. » Six months into his presidency, what is the balance sheet? Trump has hollered victory about the fact that 280,00 new jobs have been created since he took office on January 20, 2017. This statistic is misleading in many ways. The new jobs created are predominantly part-time jobs without benefits or union representation — and with hourly wages that are plummeting by the day. The jobs figure — in fact the very rosy figure of 4.5% unemployment — masks the destruction of full-time jobs and the job cuts in many of the federal agencies, such as the Environmental Protection Agency (EPA). Trump promised that he would create “millions of great jobs” through a massive public-works program funded through private and public investments. But this has gone nowhere and will likely go nowhere. Private contractors have not bought into Trump’s stepped-up construction plan, while no additional funds have been earmarked for public works in the recent budget. It was all empty promises to rope in disaffected workers in the Rust Belt of the United States. Trump also promised that he would prevent U.S. companies from exporting jobs to Mexico. He held a press conference with Carrier Corp. in Indiana to make this point. It was later revealed in the press that only half the jobs mentioned by Trump would be preserved in that particular plant, and that Carrier was exporting thousands of jobs to Mexico and other locations from its other U.S. plants. It was a staged event … that ultimately backfired. The unemployment figures are also fabricated. Workers no longer on the unemployment rolls, their unemployment insurance having expired, are no longer considered unemployed. Trump cannot tell truth from fiction. He claims that the United States has made « great strides toward being great again. » This is just grand-standing. The Wall Street Journal (July 17) noted that the current Republican Congress “is the most dysfunctional and least productive since the Civil War.” The article notes how the gridlock in Washington — primarily resulting from the crisis and divisions inside Trump’s own party — has prevented Trump from implementing his program, be it to repeal or “fix” ObamaCare, reform Dodd-Frank (on financial deregulation), enact Trump’s heralded « border-adjustment tax » (to pay for the Wall along the U.S.-Mexico border), or implement his regressive tax reform. On this last point, Trump announced publicly that he could not go ahead with his $6.2 trillion in tax cuts for the rich until after the repeal of ObamaCare, which included $592 billion in tax cuts for business and investors over the next 20 years. But with the failure of the Republicans to repeal and replace ObamaCare — a failure of immense significance — Trump’s major tax-cut plan may also be in jeopardy. The crisis is also political: Trump has not been able to fill more than half of the high-level executive branch positions. Wall Street has been «on hold » in anticipation of Trump’s major tax cuts for Big Business and his plan to accelerate the deregulation of financial markets. But signs that Trump may not be able to deliver on his promises to the banksters are already sending shock waves through Wall Street. At first, when Janet Yellen, chair of the Federal Reserve, announced that the Fed would start increasing interest rates, the Dow Jones surged. But once the economic growth projections were scaled back and uncertainty set in about the volatility of the financial markets, Yellen pulled back in terms of increasing interest rates. The backdrop to all of this is an economy skating on the thin ice of fictitious capital and unfettered speculation, an economy reflecting the impasse of a capitalist system in its death throes. The Internationale: Trump has submitted his budget for fiscal year 2018. What are its main policy objectives? Trump promised that there would be a balanced budget — in fact, there would even be a $16 billion budget surplus — by 2027. The Congressional Budget Office, upon reviewing the budget proposal, said that Trump’s projections for economic growth were totally unrealistic. According to the CBO, we can expect a sharp downturn in the economy beginning in 2018. Hence, the budget deficit would increase to $720 billion within the next 10 years. Their reasoning is as follows: Even though Trump’s budget calls for massive reductions in domestic social spending, the budget for « defense » — that is, the war budget — and for Homeland Security is through the roof. The 2018 « defense » budget, the biggest line item, has been upped to $696.5 billion, which is $75 billion higher than Obama’s record-high war budget. According to the National Priorities Project report in May 2017, the U.S. government has spent $7.6 trillion on the military and homeland security since 9/11. And this does not even include the long-term costs of caring for the badly wounded soldiers. In a word, it’s a budget of war against working people and the oppressed — at home and and abroad. The states of Maine and New Jersey have experienced partial shutdowns over the budget debates. The Internationale: Among the difficulties confronting Trump, one must note the following: The persistence in the framework of the bourgeois State of segments of political democracy inherited from the American Revolution are an obstacle to the attempts by a sector of the U.S. ruling class to impose a strongman. Is this the case? There is a growing political crisis of U.S. imperialism. Its institutions, as you point out, are not fully adapted to the tasks of world cop. The judicial system, for example, is not totally subordinate to the imperial presidency; the 9th Circuit Court of Appeals has blocked major components of Trump’s travel ban and has struck down aspects of Trump’s anti-immigrant policy. To some extent, the « checks and balances » in the U.S. Constitution make it more difficult to establish a neo-monarchical system such as Macron would like to institute in France. There is no Article 49-3 in the United States, for example. The « fourth estate » — that is, the media — is still able to express the sharp divisions that exist within the ruling class over how to steer the ship of state, despite the steady loss of independent newspapers and the concentration of news conglomerates. This is what explains Trump’s almost daily rant against the media for spewing so-called « fake news. » The mounting « Russia-gate » scandal, reported daily in the press, could possibly bring down Trump. The battle between Trump and the top officials in the FBI and Justice Department has concentrated much of the energy of the ruling class over these past six months; impeachment proceedings have been initiated by two California members of Congress. The tradition of « town hall meetings » about which De Tocqueville spoke so eloquently 180 years ago is still very much part of the fabric of the body politic. It is a holdover from an earlier period in U.S. history. TrumpCare was brought down in large part by the tens of thousands of Trump supporters who lambasted their elected officials in such meetings up and down the country. Once-ardent Trump supporters in rural America exploded in anger over plans to slash Medicaid, and they made sure their representatives got the message. The issue of states’ rights also comes into play. States’ rights represented a concession in the U.S. Constitution to the southern slave-holding states. Throughout U.S. history, states’ rights have been deployed as a means to oppose any progressive legislation coming from the federal government. The best example was the clash between the federal government and the Southern states during the Civil Rights upsurge in the 1960s. But this is only part of the story. While segments of political democracy still exist and are fostering a growing crisis in the summits of power, they are being whittled away bit by bit with each passing day. The Patriot Acts 1 and 2 have drastically curbed democratic rights. Peace activists are being taken off commercial airlines for wearing antiwar T-shirts. The imperative of « national security » has given the State the right to curtail basic rights enshrined in the Bill of Rights (the first 10 amendments to the U.S. Constitution). So while some aspects of U.S. imperialist policy have been hampered, imperialism’s destructive might continues to wreak havoc and devastation upon working class and oppressed peoples the world over, including in the United States. The Internationale: In issue no. 5 of The Internationale, we published an article that deals with the expansion of the arms economy, which is destroying the productive forces. Trump announced that he wants to increase the U.S. military budget by $54 billion. He signed some hefty contracts for arms sales to Saudi Arabia in anticipation of a future war against Iran. The U.S. government has also increased its threats against North Korea and announced tht 5,000 additional U.S. troops will be sent to Afghanistan. What are the broad outlines of Trump’s foreign policy? Trump won the presidency in part based on his claim of being an « isolationist » — that is, he would finally pull the U.S. out of all the hotspots in the world to focus on creating jobs and « making America great again. » The American people are tired and wary of all the wars abroad. Poll after poll continue to register the prevailing antiwar sentiment of the working class majority. As most people see it, an estimated $1.26 trillion have been spent in Iraq and Afghanistan alone, and the world is no safer; in fact, it is far more dangerous. Trump’s so-called « isolationism » was a lot of bunk. As I noted earlier, he has increased the war budget to its greatest levels ever. What’s more, the Republican-controlled Congress didn’t stop at Trump’s proposed $54 billion; it increased military spending by $72 billion for fiscal year 2018. As the Trump-Macron Bastille Day military review in Paris made it clear, U.S. imperialism will continue to insist that its « allies » shoulder more of the burden of military interventions across the globe, while also insisting on the U.S. government’s right to intervene any and everywhere it deems fit. Trump is putting more pressure on China to « rein in » North Korea, for example, while revving up the U.S. war machine against North Korea with the new Thaad missiles. At the same time, Trump is escalating the shipment and sale of arms to Saudi Arabia ($110 billion for FY 2018) to use proxy forces to intervene in neighboring countries, notably Iran and Syria. And U.S. support for the Zionist state of Israel and its war of annihilation against the Palestinian people is unrelenting; no longer is there even a pretense of support for the « two-state » so-called solution. The U.S. wars abroad are heating up and are likely to become explosive in many regions across the globe. 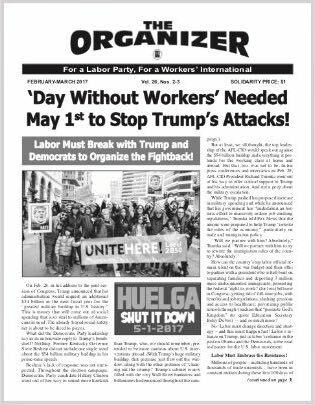 The Internationale: In a recent newsletter of the International Workers Committee (IWC), a number of trade unionists — Nancy Wohlforth, Donna Dwwitt, and Gene Bruskin – expressed their concerns over the fact that Trump’s $54 billion military buildup did not elicit any opposition from the leadership of the AFL-CIO, particularly from Richard Trumka, its main leader. Is this an indication that the American people are now supporting the U.S. wars begun by George W. Bush and then pursued, and deepened, by Obama and now Trump? USLAW activists and supporters are gearing up to present a series of antiwar resolutions to the upcoming AFL-CIO convention in St. Louis. No. The American people do not support the wars being waged around the world in the name of the « fight against terrorism. » The 2016 presidential election witnessed the second-largest rate of abstention in recent U.S. history. The people rejected the twin candidates of war and exploitation; if anything, to many people Trump appeared to be the lesser-evil, and Hillary Clinton the military hawk. The Internationale: An important delegation of trade union and Black activists was present in Mumbai and considers itself to be part of the International Workers Committee, which has placed the fight against war and exploitation at the center of its activity. What initiatives might be forthcoming to turn things around and build mass opposition to these imperialist wars and interventions? At the initiative of supporters of the International Workers Committee, union resolutions have been adopted — and actions organized — in opposition to the U.S. wars/interventions in Syria, Afghanistan, Iraq, Korea and Venezuela (where U.S. operatives are fomenting a coup against the legitimate government of Nicolás Maduro). However, the scope of these actions is far below what is needed to stay the hand of the U.S. warmakers. As Socialist Organizer, U.S. section of the OCRFI, we have examined the reasons why there are no mass, united-front actions in the streets, as existed during the Vietnam War. There are many objective reasons for this — the main one being the end of the draft and the return to a volunteer army. Some coalitions insist on coupling the demand of U.S. Out Now! with the call to support the Assad regime (which, of course, is unacceptable). Conversely other coalitions insist on coupling Out Now! with the call to end all foreign interventions in Syria, thereby placing « Russian and Iranian intervention » on an equal footing with U.S. intervention, which leads them to call for support to U.S.-financed Islamic forces — also unacceptable. The Labor Fightback Network (LFN) arose, in part, to forge unity in the U.S. antiwar movement around the « Out Now! » and « Money for Jobs, Not War! » demands. At the July 21-23 Third National Labor Fightback Conference, a resolution calling to promote the fight against war on a united-front basis was approved. Representatives of many of the main antiwar coalitions were present. The Internationale: During the last presidential election, and consistent with its policy of “lesser-evilism,” the AFL-CIO leadership supported Hillary Clinton, who was not only the Democratic Party’s candidate, she was Wall Street’s candidate. After the election, hundreds of thousands of people demonstrated in the streets on January 19, 20 and 21 to express their rejection of different aspects of Trump’s reactionary agenda (in defense of immigrant workers, against the privatization of public education, etc.). But the leadership of the AFL-CIO was absent from these protests. Later, Trumka met with Trump and expressed his willingness to cooperate with the new president. But Trump’s program calls for extending the “right to work” (for less) laws throughout the United States. These laws are aimed at decimating the trade union movement. What can you say about this? The massive outpouring of anger and resistance to Trump’s reactionary plans far exceeded all expectations. It is now estimated that more than 3 million people took part in the actions on January 19-21 in more than 520 U.S. cities. In many cities, trade union locals were present. Hundreds of thousands of unionists were also out in the streets, but the large majority were not in organized union contingents. The big missing player was the organized labor movement, whose leaders were meeting with Trump in Washington and offering their support to Trump’s supposed « job creation » plan — an absolute myth. — and his plan to « reform » the immigration system to “protect U.S. workers” (thus reverting to retrograde positions that the AFL-CIO had abandoned in the late 1990s). At those meetings, I should add, the top labor officials did not challenge, let alone denounce, Trump for his insistence on expanding « right to work » legislation across the United States with his proposed federal « right to work » law. And we cannot mince words here: This is an all-out and undisguised assault to obliterate the organized labor movement in the United States. The image of what lies ahead can be seen in the U.S. South, where « right to work » legislation has existed since the early days of the trade union movement. The rate of unionization hovers around 3% of the workforce; strikes and workplace actions are non-existent. Exploitation runs amok. Transnational corporations that faced union drives in Mexico or Korea are now relocating to the U.S. South, where there are no unions and corporate profits can rise sky high. The image of what lies ahead can also be seen in the state of Wisconsin, where public employees first organized on a mass scale in the late 1940s and early ‘50s. After the Democratic Party betrayal of the Wisconsin uprising of 2011, the rightwing backlash was merciless. Governor Scott Walker and the Republican state legislature enacted « right to work, » and unionism plummeted drastically across the state, opening the door to the full-scale destruction of public schools and social services. Then followed « right to work » in the industrial heartland of Michigan. It was an outrage, widely denounced in the ranks and mid-levels of the U.S. labor movement that Trumka and the heads of the building trades should be meeting in Washington to essentially give « critical support » to the Trump anti-labor agenda. The Internationale: Despite the top labor leadership’s bending to the bosses’ policies, there is resistance at all levels of the trade union movement. You yourself are a trade union activist in California: Can you explain the significance of the Resistance Committee formed by the San Francisco Labor Council and the Resistance Summit convened by the California Federation of Labor? On June 28-29, a statewide Labor Resistance Summit was held in Los Angeles to organize the resistance to « right to work » statewide. Close to 800 designated delegates from all across California attended the summit. This was positive; it marked a first effort to centralize a fightback. The keynote speaker was AFL-CIO President Richard Trumka. But the summit itself was very disappointing. Rather than prepare the fight to stop the dismantling of the trade unions under « right to work », Trumka and the California Federation of Labor leadership focused on how labor needs to organize new members once « right to work » is enacted by the Republican Congress and then ratified by the Republican Supreme Court. In a word, they conceded defeat, before even waging a fight. What unionists gathered in Cleveland for the Labor Fightback Conference said is that conditions are ripe, with the major schisms in the summits of political power in Washington and with the massive resistance movements in the streets, for labor to go on the offensive and organize national days of action and strikes to stop « right to work » — in conjunction with labor’s allies (because when unions are destroyed, so are wages and improved working conditions for all working people, whether organized or not). The doom-and-gloom scenario projected by Trumka in Los Angeles is disarming and self-defeating. But it is a scenario that is being challenged by growing numbers of unionists at all levels who are not satisfied with the responses being offered by those at the helm of the trade union movement. The Internationale: The AFL-CIO will be holding its convention in St. Louis this coming October. At this writing, Trump’s goal of repealing and replacing ObamaCare is in trouble. How is this vital question of healthcare posed at this time, and what are the stakes of this convention? The issue of healthcare — of the absolute need to win Single Payer — is at the center of the political situation in the United States. The time is ripe, with the rifts among the Republicans, for the labor movement and the massive numbers of Single Payer activists to go on the offensive to enact Single Payer. There is no other solution to the healthcare crisis than to expand Medicare (a single payer system that works well for seniors) to people of all ages. The national AFL-CIO convention held in Pittsburgh, Penn., in October 2009 voted to support Single Payer. This was very significant. But no sooner had they approved this resolution for Single Payer than they shelved it by voting to support and lobby for ObamaCare, a system based on expanded private (and costly) health insurance. Trumka said, « We are for Single Payer in the long run, but it is not an attainable goal at this time, so we must take incremental steps by supporting the Affordable Care Act [ObamaCare] ». Things were so bad that the AFL-CIO leadership supported the Democratic National Committee’s decision at the July 2016 Philadelphia Democratic Party convention to ban any discussion of Single Payer at the convention, as such language could be seen as harmful to Hillary Clinton and to her chances of winning the Democratic Party nomination and the presidency. Needless to say, Bernie Sanders’ supporters, who made Single Payer their main campaign slogan, felt betrayed by the DNC and by the top officials of the U.S. labor movement. But here, too, this is not the end of the story. Single Payer advocates are out in force in the streets nationwide. They are proposing statewide Single Payer initiatives (such as SB 562 in the state of California) and are building coalitions and alliances to advance this issue. The Labor Campaign for Single Payer Healthcare, which is supported by top labor officials in more than 28 states, and by hundreds of local unions, is one of the most dynamic wings of the labor movement. And they are picking up more steam as they go. The Internationale: One of the most brutal aspects of Trump’s anti-working-class policies is the aggravation of the policies already implemented by Obama against immigrant workers. These are workers who were forced to flee Mexico and Central America by the ravages created by the « free trade » agreements and by the drugs and mafiosi economies. These policies are concentrated in Trump’s proposal to build a Wall all along the U.S.-Mexico border. And this, at a time when the workers’ and popular mobilizations are growing against the government of Enrique Peña Nieto in Mexico. What discussions have taken place, what common initiatives have been agreed to, by Socialist Organizer and by the comrades of the OCRFI in Mexico? “This Wall of Shame, as it is called on both sides of the border, is the outcome of more than 20 years of U.S.-imposed ‘free trade’ policies (NAFTA and CAFTA, in particular) that have destroyed Mexico’s economy, turning a sovereign nation into one big maquiladora pass-through sweatshop for the transnational corporations. These policies have forced millions of Mexican and Central American peasants, workers, and youth to flee to the United States in the hope of finding a way to feed their families. “Trump is out to ‘renegotiate NAFTA’ — but only to benefit U.S. corporations, NOT to benefit workers in Mexico or the United States. The new agreement that Trump is pushing will only deepen the attacks on working people and their organizations, primarily their unions. “More than ever, workers and youth need to reach out across the border and unite in an independent struggle to tear down the Wall of Shame, stop NAFTA and CAFTA, and stop and reverse all the policies emanating from the ‘free trade’ corporate agenda. We have the same interests, and we are waging the same struggles to protect our interests as working people. “To promote this cross-border fightback, we, the undersigned unionists and activists call upon our sisters and brothers on both sides of the border to endorse this appeal and promote it as widely as possible among your labor and community organizations. Let’s work together to build a broad-based binational conference around these common demands, the date and place to be determined by the initial signatories. “• Tear Down the Wall of Shame! “• Not One More Deportation! “• Stop NAFTA and CAFTA! “• Stop All Privatizations and Counter-Reforms! The Internationale: All the problems that we have raised here bring us back to one question: Faced with Trump, himself the expression of the profound crisis of the capitalist regime on a world scale and in the United States, the U.S. working class does not have its own political representation, its own party. The trade union leaders remain subordinated to the Democratic Party, one of the twin parties of the U.S. bourgeoisie. In his discussions with the leaders of the Socialist Workers Party in the late 1930s, Leon Trotsky put forward the perspective of a Labor Party — that is, a workers’ party based on the powerful trade union movement. Is this perspective still valid today? The call for a Labor Party based on the unions and linked to the struggle for an independent Black political party is more relevant today than ever before. The trade union movement, though severely weakened by decades of reliance on the Democratic Party, still remains a formidable force. And its potential power, if unleashed from its subordination to the Democrats, is exponentially greater. Just in the 2016 presidential election, the unions spent $400 million to support Clinton; SEIU alone put up $70 million. The unions mobilized tens of thousands of canvassers and knocked on 9.5 million doors, according to the AFL-CIO. They spent $40 million alone in registering new voters. The unions, of course, mobilized to support THE candidate of Wall Street, someone who was rejected by a huge number of union members; Clinton just narrowly beat Trump among union households. This is why their effort failed. But the fact is that these resources still exist and could be placed at the service of independent working class political action. 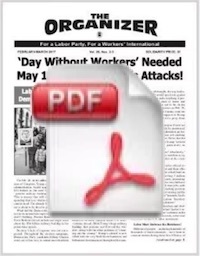 As we have stated time and again in the editorial pages of The Organizer newspaper, the number one obstacle facing working people in the United States is the subordination of the leadership of the trade unions — the only organizations that represent and organize the workers on a class basis — to the Democratic Party. Helping to break the unions away from that vise-grip is therefore one of the central tasks facing independent labor activists. What’s needed now is a national organizing committee, with labor, Black and Latino leaders at the helm that promotes a new political strategy for labor. Such a committee — modeled after Labor Party Advocates — would, of course, promote independent mass actions of resistance in the streets, but its focus would be to get the ball rolling to run genuinely independent labor-community candidates for local and state office in 2018. “In assessing the crushing defeat suffered by labor in the November 4 elections, the need to re-evaluate our election strategy is imperative. In our view, labor — together with our community partners — needs to run its own independent candidates for public office and not rely on any political party to do for us what we must do for ourselves. . . .
“People are fed up with the two major parties and soundly repudiated the Democratic Party on November 4, a party we continue to support each election cycle with funding and boots on the ground. It’s time for a change! It’s time to develop an effective alternative! “The lack of a critical voice from labor and its allies in the electoral arena has resulted in a monopoly of power by the big corporations and their political bagmen, with Wall Street popping the champagne corks as a result of the elections. “Therefore, we urge and hope that the North Shore AFL-CIO Federation of Labor will schedule such a debate in the days ahead. The time is now to take this Open Letter and transform it into resolutions to be submitted to unions and labor councils across the country. The time is now to hold a broad-based conference of labor and the oppressed to promote running independent-labor community candidates and moving the discussion around the need for a new political party of the working class majority — a party based on the unions and the communities of the oppressed. This is the perspective that many of us put forward at the Labor Fightback Conference in Cleveland on July 21-23 — and that was approved by the conference. The Internationale: The Black question in the United States has always been understood by Marxists as a particular national question that remains unresolved. The SWP, before degenerating, had adopted the Freedom Now! Manifesto. In it, the SWP sought to formulate the Marxist position on the Black question and on the call for an independent Black political party. In recent months, The Organizer newspaper has interviewed Black militants, including activists in the  People’s Progress Party in Baltimore, who ran candidates for local office in the recent elections. These activists were present in Cleveland. What are the perspectives today for independent Black political action? Indeed, as the Freedom Now! Manifesto of 1965 made it clear, a major component of the fight for working-class unity and independent political action is the Black liberation struggle, and more specifically the fight for an independent Black Party. The murder of Michael Brown in Ferguson sparked the beginning of a mass upsurge against police violence based on the assertion that Black Lives Matter. A new Civil Rights movement is taking shape. We are at the beginning of a long struggle that must uproot white supremacy and a system based on racism. There is a state of emergency in Black America, with mass unemployment at depression levels, mass incarceration and an epidemic of police violence. Many gains of the Civil Rights era have been eroded or destroyed. Voting rights are under attack, and income inequality affects Black people at a disproportionate percentage. Austerity and the assault on public-sector employment have translated into a further setback for living standards in the Black community. Because of a history and pattern of discrimination in the private sector, Black people are 30% more likely to find employment in the public sector. Budget cuts during the “Great Recession” were devastating to an already vulnerable population. The struggle against police brutality and racism is an urgent task that cannot be simply reduced to one of class against class. White supremacy has been and continues to be the central source of division within the working class in the United States. To help overcome this obstacle, we must fight for the labor movement to champion the rights of Black people for self-determination. This will require breaking with the Democratic Party. The struggle for a Labor Party — including the fight for an independent Black Party linked to the struggle for a Labor Party — remains the principal means today for U.S. workers and their organizations, with their oppressed allies, to break free of the stranglehold of the capitalist parties. The Internationale: Issue No. 6 of The Internationale in English was distributed in the United States, and the Notes Preparatory to the World Conference of Sections of the OCRFI (November 2017) were read and discussed widely, not only by members of SO but by supporters who have known and supported the Fourth International over many years. In a few words, what were the reactions to this document? Reactions overall have been extremely positive. Comrades are interested in exploring the political roots of the crisis, and, more particularly, of the CCI’s adaptation to the upper echelons of the trade union bureaucracy. This, in turn, has sparked a discussion about the Committee of Correspondence supporters in Brazil, who blocked with the Lula leadership of the Workers Party in a common caucus, thus turning their backs on the historic program of the Fourth International. Meetings have also taken place with active supporters of Socialist Organizer to discuss this issue No. 6 of The Internationale. The discussion has only just begun in the U.S. section around this seminal document. The Internationale: One-hundred years after the October 1917 Revolution, Socialist Organizer had decided to hold educational conferences devoted to the study of this revolution. The October Revolution produced upheavals in the U.S. labor movement, just as it did throughout the labor movement worldwide. Does it still make sense to speak of October 1917 in … 2017? U.S. journalist John Reed’s « Ten Days that Shook the World » revealed the big impact that the Russian Revolution had among workers and activists in the United States. The « Russian question, » as it was called, was at the heart of the internal struggle in the U.S. Communist Party that ultimately led James P. Cannon and his supporters to break with the CP and found the Trotskyist movement in the United States in the late 1920s. For more than 70 years, the debate over the Soviet Union and the policies of the Soviet bureaucracy were at the center of all the disputes within the labor and revolutionary movements. Most of the groups on the U.S. left now argue that with the demise of the Soviet Union, the lessons of the October Revolution are no longer relevant for today. We disagree 100%. The impasse of the capitalist system poses with greater force today the alternative of socialism or barbarism. Socialist Organizer will be holding an educational conférence later this summer to underscore the relevance of the Russian Revolution for workers and youth today. (1) The “Rust Belt” is a region in the Midwest and Northeast of the United States (from Chicago to the Atlantic Coast, along the Great Lakes). It is so designated because of the deindustrialization that struck this region from the 1980s onwards. (2) “Bankster” is a neologism formed with the words “banker” and “gangster” and designates the crooked speculators. (3) On November 18-20, 2016, the World Conference Against War, Exploitation and Precarious Work was held in Mumbai, India. It brought together hundreds of delegates from all over the world. At the conclusion of its deliberations, it formed the International Workers Committee Against War and Exploitation, For a Workers’ International (IWC). (4) Single Payer refers to a system of healthcare with only one payer — thereby removing the private insurance companies from the picture — based on workers’ solidarity. (5) NAFTA is the North American Free Trade Agreement that was signed in 1994 between Canada, Mexico and the United States for the benefit of U.S. capitalists. CAFTA (Central American Free Trade Agreement), signed in 2004 and 2009, establishes a “free trade” area between the United States and the following countries: Costa Rica, Dominican Republic, El Salvador, Guatemala, Honduras and Nicaragua. (6) SEIU is a 2.2 million-member union in the United States and Canada, in services, healthcare, and security and maintenance. (7) Labor Party Advocates was formed in the early 1990s by trade union activists and union federations and locals fighting for a Labor Party. Led by Tony Mazzocchi (who died in 2003), it was an organizing committee that ultimately paved the way for the formation of a Labor Party based on the trade unions in 1996. Socialist Organizer militants were involved in this effort. (8) The Socialist Workers Party followed the Communist League of America. It was founded in 1938 and became the U.S. section of the Fourth International founded by Leon Trotsky in the same year. It was one of the most powerful sections after the extermination by Stalin of the Bolsheviks-Leninists in the USSR. With its main leader, James P. Cannon, the SWP refused Pabloite revisionism in 1950-53 but participated in the 1963 “unprincipled reunification” with the Pabloites. By the end of this degeneration, the SWP abandoned, in the early 1980s, any formal reference to Trotskyism and switched to Castroism. (9) The Ujima People’s Progress Party is a Black workers-led political party based in Baltimore, Maryland. In 2016 it ran Nnamdi Scott for Baltimore City Council.